A Cabaret evening is being held on Saturday 31st March2018. 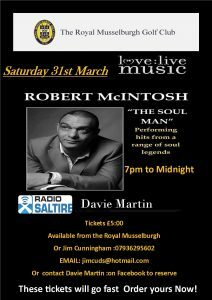 All members of the Royal Musselburgh Golf Club and their guests are welcome to attend to what will be a wonderful night of entertainment. Please obtain tickets from the Royal Musselburgh Bar, or Jim Cunningham on 07936295602 / Jimcuds@hotmail.com or Davie Martin via Facebook.